The joyous Mid-Autumn Festival, the third and last festival for the living, was celebrated on the fifteenth day of the eighth moon, around the time of the autumn equinox. Many referred to it simply as the "Fifteenth of the Eighth Moon". In the Western calendar, the day of the festival usually occurred sometime between the second week of September and the second week ofOctober. This day was also considered a harvest festival since fruits, vegetables and grain had been harvested by this time and food was abundant. With delinquent accounts settled prior to the festival , it was a time for relaxation and celebration. Food offerings were placed on an altar set up in the courtyard. Apples, pears, peaches, grapes, pomegranates , melons, oranges and pomelos might be seen. Special foods for the festival included moon cakes, cooked taro, edible snails from the taro patches or rice paddies cooked with sweet basil, and water caltrope, a type of water chestnut resembling black buffalo horns. Some people insisted that cooked taro be included because at the time of creation, taro was the first food discovered at night in the moonlight. Of all these foods, it could not be omitted from the Mid-Autumn Festival. 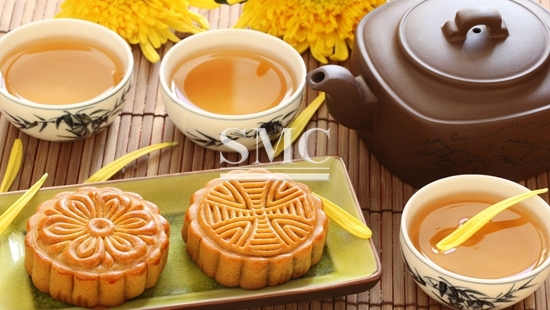 The round moon cakes, measuring about three inches in diameter and one and a half inches in thickness, resembled Western fruitcakes in taste and consistency. These cakes were made with melon seeds, lotus seeds, almonds, minced meats, bean paste, orange peels and lard. A golden yolk from a salted duck egg was placed at the center of each cake, and the golden brown crust was decorated with symbols of the festival. Traditionally, thirteen moon cakes were piled in a pyramid to symbolize the thirteen moons of a "complete year," that is, twelve moons plus one intercalary moon.